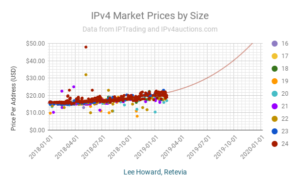 Prices in the IPv4 market have been rising. That shouldn’t surprise anyone. What might be a surprise is how fast they’ve been rising recently. The chart above shows the entire history of the market from the data provided by two address brokers. 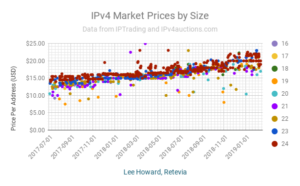 IPTrading provided theirs privately, and IPv4Auctions (by Hilco Streambank) makes their historical data publicly available. When the market started, prices were all over the place, and there weren’t many transactions. In 2015 it settled down, with buyers, sellers, and brokers knowing more and becoming more sophisticated. Since that time, it’s been clear that the price per address has been higher for smaller blocks. Some time in 2017 (maybe earlier, but it doesn’t appear in these data), that began to change. Sellers began to realize that there were far fewer large blocks than small blocks, and a buyer who needed 4 million addresses would much rather have one /10 than 16,384 /24s. So the price per address for very large blocks (well above /16) rose higher than for small blocks, according to several brokers. For medium sized blocks (/20 – /17) the price also rose, but generally in the range of the small blocks. It’s almost as if the price of /24 blocks waited for the rest of the market to catch up. But as prices for small and medium blocks converged, it looks like there’s been an inflection in the market, beginning in March 2018. Past performance is no guarantee of future return, but since there seems to be a trend, let’s extend it forward. Predicting the future is tricky; it’s even hard to predict the past sometimes. Starting in 2018, when the price clustering is pretty close and there’s a peak, the trend for /24s could fit a 3rd order polynomial curve or a 2nd order polynomial (quadratic curve). In the chart above I’ve chosen to show the more dramatic 3rd order polynomial curve; a quadratic projection would be $30 by the end of 2019. A linear projection for /24s doesn’t quite fit the plots, but would see /24 prices at about $25 by end of year. As you remember from high school math, a quadratic curve is a parabola. In the case of /20 and /21, there have been some recent transactions that were lower than some earlier transactions; that doesn’t mean prices are declining. The fact that the curves for /24, /23, /22, and /18 cluster together, and are midway between outliers /19 and /17, seems telling. And it’s telling us that address prices may be above $40 each by the end of next year. 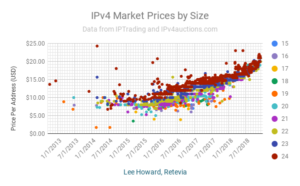 For people accustomed to thinking about IPv4 address prices around $10 per address (I’ve gotten spam from buyers looking to pay $6/address), $50 per address seems outlandish. For some networks, such as mobile carriers and broadband providers in lower-income areas, $50 probably exceeds the lifetime profit on a customer–they would be better off selling addresses than turning up new customers. Is this realistic? I did this exercise a year and a half ago, and prices are just about where the quadratic curve would put them. The question everyone wants answered is when will prices come down. Sellers, in particular, want to sell high. Buyers, on the other hand, probably realize that hoping address prices fall before they need them is risky. Prices will come down when demand falls. For blocks above /16, that will be when the major cloud providers around the world have acquired enough space to meet their foreseeable needs. That could happen in the near term, but it may not affect the prices of /16s or smaller blocks. Supply and demand for /16s and smaller are independent of the large blocks; there is enough potential supply in the /16 and under range to supply a market for a few years, even extrapolating (quadratic curve) from Geoff Huston’s number of transactions per year (his Table 4). 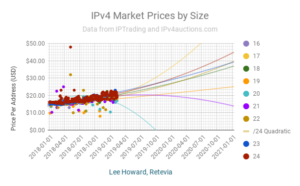 In summary, IPv4 prices are rising fast, but so are the number of transactions. Those who wish to capitalize on the market may find it prudent to do so in the next year or so, as rising prices put them out of reach of most of the world. 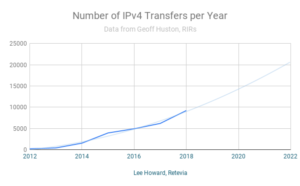 The only alternatives are large-scale NAT44, or deploying IPv6 with translation, and of course, Retevia can help with IPv6 deployment.